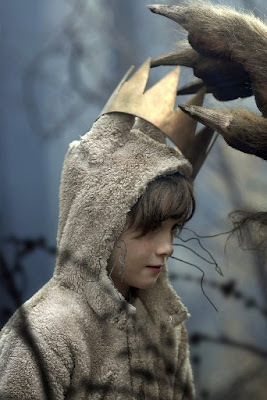 “Where the Wild Things Are”: What did your kids think? Usually, when I’m reviewing a movie that’s aimed at kids, I try to bring one along. (I’ve had a handful of willing volunteers over the years, though they’re always playing the dirty trick of growing up on me.) But sometimes, movies screen during school hours and at press screenings where we’re not invited to bring a guest, so I’m on my own. Such was the case for “Where the Wild Things Are,” Spike Jonze’s imaginative and, yes, odd take on Maurice Sendak’s beloved tale. (Jonze has said in many interviews that his intention was not to make a children’s film — and, indeed, he hasn’t.) As I noted in my review, I think kids will have a variety of reactions to it: Some may love it, some may be scared by it, and some (and my guess is that this might be the majority) may just be bored by all the talk and little action. People are always asking me what age is OK for a particular movie, which I think is an impossible question to answer. Every 10-year-old, for example, is different and I’m in no position to assess what a unknown child might find upsetting (or what that child’s parent might find upsetting, for that matter). I always send people to the website www.kids-in-mind.com, which provides detailed content information on movies so that parents can decide for themselves what might be appropriate for their children. If pressed regarding this movie, I might say that I think I’d hesitate before taking a child under 8 to “Where the Wild Things Are.” Which isn’t to say that there aren’t 10-year-olds out there who might be frightened by it, or 6-year-olds who might love it; it’s just a guideline, to be adjusted to suit the kid you know best. What I’d really like to hear are reactions from real kids. Did you go to “Where the Wild Things Are” this weekend with your family? What did the kids think?